this system is not a tool to be used for petty grudges or any general malice. - Fleeing a fight means you must leave the situation entirely once completely successful. - People who were part of one group cannot participate in another group’s fight involving the same target. - Ideally, the party members should be made apparent either ICly or OOCly before the battle takes place. - In densely populated cities/areas, you must wait five rounds to flee from the first battle, and ten rounds before fleeing the second battle. If you flee before this time, you will be warned and potentially have your fight either redone or suffer an automatic loss. 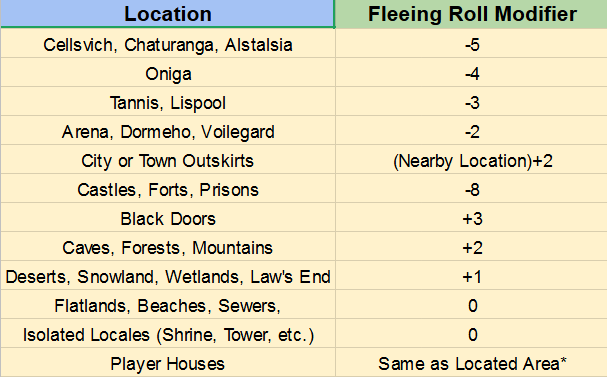 - The fleeing party will have to decide between leaving their downed members behind or making another flee check (with adjusted modifiers for the party composition change) to try and save them. If they succeed, they may rescue their friend. If they fail, the remaining members must fight again without the downed members. - When attempting to rescue a KO'd party member, individuals may only carry one person at a time. - Declare your intent to flee before fights, any fight done without this intent being plainly known will not be considered as one of the necessary fights before being allowed to flee. *Wherever your house is ICly located, use the related number on the chart as the modifier. * Kaelensian Pursuers also gain this bonus. Umbral Runners gain a further +4 at Night Time. ** Kaelensian Pursuers also gain this bonus. If the pursuer(s) get the higher roll, a fight takes place, if the runner(s) get the higher roll, they get to escape. In instance of a tie, the runner(s) can opt to change to a relatively nearby location and the pursuer(s) can follow and then new opposing rolls between the tied groups are made. After the fight, if the pursuer(s) win, the runner(s) are at their mercy. If the runner(s) win, they flee the scene. If the runner(s) opt to not fight, it will be considered an automatic loss and they are at the pursuer(s) mercy. In the case of multiple groups intended to pursue, both pursuing groups make their rolls, the one with the higher result will get to fight first, followed by the second group if the first group loses. Reroll in case of a tie between pursuer(s) if it would be a successful result against the runner(s). If one group of pursuer(s) fails and another succeeds, only the successful group can fight them at all. A second group can be formed before or during the first fight and be on standby to intercept, however only up to two groups can intervene against the runner(s), if the runner(s) succeed to flee or are victorious over the first pursuer(s), a second flee roll between the second pursuer(s) and the runner(s) can be made and resolved. To reiterate; no more than two groups can try and catch a fleeing party. In the case of multiple runner(s) that aren’t affiliated (if you’re together, you should be partied up), only one group can deal with a situation at a time. You must pick which runner group to pursue. If you’re in a large party, you can, for instance split your groups into two in order to nab two runner(s). Otherwise, a completely untargeted group can flee unopposed. For group size, the modifier is mostly self explanatory, the group gains a +1 bonus per additional person in the group, up to 4 members. For one person, this means no bonus, for a group of four, this means a bonus of +3 to their result. For location, it is determined based on where this is happening. Generally speaking, populated areas like Cellsvich are difficult to escape from but isolated places like forests are easier to escape from. Only the fleeing parties' total is modified by this. Group 1 is a team of three guards dealing with Group 2 who are a couple of muggers caught attacking someone in the middle of Cellsvich. Group 2 is trying to make a getaway before Group 1 can catch up to them. They roll to see what happens. The guards roll a 12 and get a +2 for being a team of three for 14. The bandits roll 14 and get a +1 for being two man group for 15, unfortunately, since this is Cellsvich, their roll is penalized by 5 for a new total of 10. They get caught so now they have to fight it out. The guards are able to beat them in the fight and now the muggers are at their mercy. The conflict is resolved.